A survey released by Tamara Draut, vice president of policy and programs at Demos and co-author of The Plastic Safety Net: How Households are Coping in a Fragile Economy, revealed that 37 percent of low-income and middle-income households use their credit cards for basic living expenses such as housing, groceries and utilities on a regular basis. The average low-income and middle-income American who uses their credit card to pay for basic living expenses carries credit card debt totaling around $9,827. But those households who don’t use their credit cards for basic living expenses only have an average credit card balance of $7,995. That’s a huge difference. What many credit card consumers don’t realize is that credit card debt can quickly add up putting families at risk for default, lawsuits and wage garnishments . What’s surprising is that the survey also found that those families using credit cards to pay for basic living expenses mostly used income tax refunds and worked longer hours or took a second job to pay down debt. How many of them considered bankruptcy? The authors of the report did not ask; but it wouldn’t be surprising if only a few even knew that bankruptcy could help them discharge many of their debts and get a fresh financial start. If you’re so financially strapped that you’re using credit cards to pay for food, utilities and other basics, it may be time to talk to a bankruptcy attorney. *State income taxes of $195,000 dating back to 2004. *$70,000 in credit card debt. Whether a debtor has many assets or few, bankruptcy can be a logical and practical solution to a situation that is often difficult to overcome. Even the rich are experiencing a rough time in this turbulent economy and turning to bankruptcy for relief is considered by many celebrities to be a smart move. 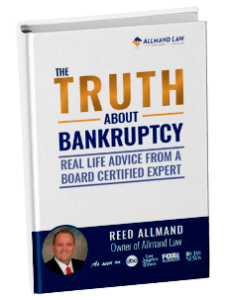 “Ordinary” debtors facing maxed out credit cards, foreclosure and back taxes should consider all of their options including Chapter 7 bankruptcy and Chapter 13 bankruptcy.